The world is heavily relying on solar energy to save the day, especially after we have exhaustively used the non-renewable sources of energy. An engineering firm in France, Colas, has designed a 1-kilometer-long road in Normandy. What is so special about a road, one may ask. Well, this entire strip of road, as it turns out, is made entirely out of solar panels. This roadway, called the Wattway, goes through the little town of Tourouvre-au-Perche. It is actually a trial, which is supposed to be tested for 2 years to see how much electricity it can generate. The road is expected to be used by about 2000 motorists per day. The project was financed by the French Ministry of Environment. The initial estimates of the power output suggested that it will be enough to run all of Tourouvre-au-Perche’s street lights. The Wattway is estimated to produce 280 megawatt hours (MWh) of energy annually, with an estimated electrical output of 767 kilowatt hours (kWh) per day. The Ministry of Environment stated that it is enough to produce electricity for a population of 5000 people, provided the weather conditions are favorable. The town itself has a population of 3500. This has never been done before and so, the project does face a bit of criticism when it comes to the cost. The cost of building the Wattway at €5 million (about US $5.2 million) doesn’t quite add up, considering the energy it produces costs 13 times more than the standard rooftop panels. Why exactly is this so? It could have something to do with the fact that the Wattway was designed to withstand the load of driving cars and loaded trucks over it. The panels have a sheet of silicon resin over it, so they can survive heavy traffic. In contrast, a similar project was done in the Netherlands in 2014 for a biking track, but it only had to withstand the load of bikes and not cars. Colas is determined to reduce the cost of the solar road so it can get competitive with other engineering firms. 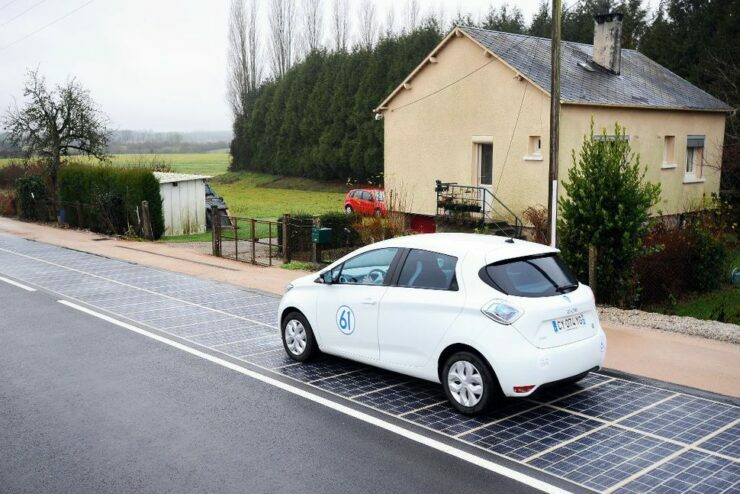 It also aims to provide France with 1,000 kilometers (621 miles) of solar-panelled roads in the next four years or so. Whether the company is able to achieve this or not is entirely dependent on how this 2-year trial goes. The firm also aims to expand this technology to other countries, if proven successful.